Burglary offenses are serious crimes that can rise to the level of felony and involve theft or violence. The charge alone can cause severe harm to your reputation and employment, and even worse a conviction could mean serving an extended time in prison. A knowledgeable burglary defense attorney can help reduce your sentence time if convicted or establish a defense to counter the charges. Burglary is defined as the breaking and entering of a building with the intent to commit any crime within the property. The crime committed within is not limited to just the theft of property, it can also include assault or other crimes. The emphasis is that burglary involves the intent to commit any crime once inside. First-degree burglary is the breaking and entering of a dwelling of another with the intent to commit theft or a violent crime. A dwelling is considered a place where people reside. This is a felony crime punishable by a maximum term of 20 years in prison. First-degree burglary is considered to be the most severe burglary crime. 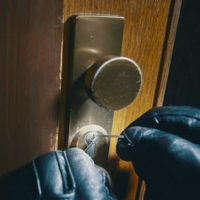 It is seen as the most serious because the burglary involves entering a dwelling, which increases the likelihood of encountering a resident that could lead to violence or even death. Second-degree burglary is the breaking and entering of another person’s storehouse with the intent to commit theft, a violent crime, or arson. A storehouse can be a building, pier, boat, or railroad car under the Maryland legal definition. It is defined broadly and generally, any structure that is not a dwelling is likely considered a storehouse. Second-degree burglary is a felony punishable by up to 15 years in prison, or if the intent of the breaking and entering was to steal, remove, or carry away a firearm then prison term increases to a maximum of 20 years. Third-degree burglary is the breaking and entrance into a dwelling of another with the intent to commit any crime. This is a felony with a punishment of a term of no more than 10 years imprisonment. Third-degree burglary is a lesser degree offense that falls within first-degree burglary. This means a charge of first-degree burglary will likely include a charge of third-degree burglary. Fourth-degree burglary consists of four different crimes that are all misdemeanors with a total prison sentence not to exceed three years. A first or second-degree burglary charge will also most likely mean a lesser included offense, fourth-degree burglary. Fourth-degree burglary includes the breaking and entering of another person’s dwelling or storehouse. As well as being in or on the dwelling or storehouse of another; or a garden or yard belonging to another’s dwelling or storehouse with the intent to commit theft. Possession of burglar’s tool with the intent to use them to commit a crime is also fourth-degree burglary. If you are facing burglary charges, you should know that a conviction can result in significant jail time. You need an experienced attorney from The Law Office of Hammad S. Matin, P.A. to defend you. Our La Plata and Waldorf criminal defense burglary attorneys will represent you. We have defended clients throughout Charles County for criminal misdemeanor and felony offenses. Let us use our vast knowledge to strategize the best possible defense for you.